(CNN) -- Thunderstorms and high winds are expected to keep sweeping across Missouri and Kentucky on Saturday after Friday's pounding rain left thousands without power, officials said. 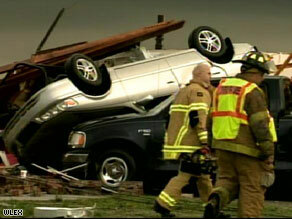 Strong winds tossed one car on top of another Friday in Kirkville, Kentucky. Wind gusts in both states could reach 70 mph Saturday morning, forecasters said. High winds, thunderstorms and flash floods caused damage on Friday to homes in southern Missouri. Three people were killed and more than 150,000 people were left without power, according to Missouri's Emergency Management Agency. A couple was killed when a tree fell on their car on a highway near Poplar Bluff, Missouri. A man died of a heart attack near Springfield when winds tossed him and his wife into an open field, officials said. Glenn Bryan, 68, was watching weather reports on television while taking shelter in the basement of his Pomona, Missouri, home when the power went out. He went upstairs to find a radio just as a tornado came through. Bryan grabbed a door handle "and hunkered down," he told CNN affiliate KYTV. "Couldn't hold on much longer," he said. "I thought I'd be gone to the woods." The back of the house blew away, a tree shattered a large window in front, and his friend's pickup truck flipped upside down, KYTV reported. "I was stupid" for leaving the basement, Bryan told the station, "but I wanted to know where the storm was ... and I found it. I found it." Bryan's insurance company treated him right, Bryan told KYTV. "Insurance said, 'You've paid us long enough; now we'll pay you!'" he said. The storms were also deadly in Kentucky on Friday. One person was killed about 5 p.m. when the storms escalated to "what is believed to be tornadoes," said Carl Richards, the director of the Madison County emergency management agency. Richards said one person is missing and the storm cause a "significant number of injuries." Some of the injured were taken to nearby hospitals while the more serious were transported to trauma centers in Lexington. The National Weather Service will be in Madison County on Saturday with assessment teams to survey the damage and determine if it was caused by tornadoes.